We are currently beginning a planning and fundraising phase, working through the Foundation Center’s Arkville Extension at the Catskill Center for Conservation and Development, to secure grant funding from a variety of sources, both public and private. These funds would be used to help Overlook Mountain Center permanently protect this land as a historic site listed in the National Register. Eventually we would like to find a permanent home for the Overlook Mountain Center, a single small building where people can learn, through ongoing programming, about the history, culture and wisdom the mountain has to offer. Please consider joining our cause and volunteering. We seek creative, resourceful, friendly, open minded people to help us fulfill our mission. It’s been 5 years since Overlook Mountain Center (OMC) made news in its endeavor to preserve land in Lewis Hollow and provide cultural programming related to Overlook Mountain and its environs. OMC Chairperson Glenn Kreisberg has recently published a book about his 10 year quest to understand the lithic constructions found in the backwoods of the northeast, including the Lewis Hollow site on Overlook Mountain. When you purchase a copy of Spirits in Stone from the OMC website, you receive a 10% discount PLUS 10% of the proceeds are donated to Overlook Mountain Center. My new book, Spirits in Stone, will be out April 10th, from Bear & Co. 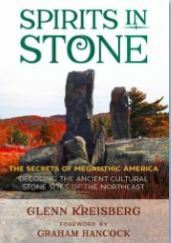 In it I document over a decade of research into man-made stone constructions in the backwoods of the northeast, with a f ocus on the Catskill and Shawangunk mountains of New York. I examine the potential origins and purposes for a myriad of different types of old stone structures found on the land, including walls, cairns, perched boulders, effigies and more. I also examine important sites around the world for insights into ancient megalithic culture. In the northeast U.S., as elsewhere, the patterns revealed through the eye of landscape archaeology and archaeoastronomy speak to the sophisticated belief system of an ancient population that understood the complex movements of the night sky and integrated those beliefs into their lives and world view. I believe they accomplished this through the cultural practice of celestial observation, landscape manipulation and monument construction, as well their travels and contacts with peoples from other regions and parts of the world. This is controversial information, as generally for our region, this is not accepted to be true by conventional historians. I hope this book helps change that view.